Kidlington is located in Oxfordshire, about three miles north of Oxford. It is sand witched between the Oxford Canal and the River Cherwell. There are regular bus services to Oxford. It is home to an ancient church, so it is a strong community with the identity of a parish council. The Exeter Hall is a large village hall accommodating doctors’ surgeries and dentists, and there are banks, building societies and locksmiths in Kidlington. Kidlington obtained its name from an old English term meaning settlement. The village is home to the parish church of Saint Mary the Virgin. The church has since retained a spire known as Our Lady’s Needle. By the side of the church is an alms-house built in 1671 by Sir William Morton. There are several chocolate box style cottages in the older areas of Kidlington. The environment in Kidlington is relaxed and peaceful. There is a weekly market, and there are several shops which provide opportunity for villagers to do their shopping. Prominent national retailers such as Tesco, Sainsbury’s, Greggs, Iceland, Co-Op, Superdrug and others are located in the precinct. Kidlington is also serviced by independent service providers such as CPPM, a local locksmith firm, based in Abington. 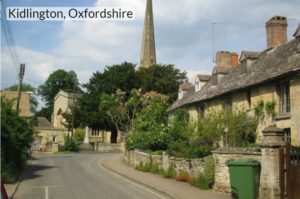 Although there are locksmiths in Kidlington, CPPM Locksmiths are the go-to locksmith professionals serving Kidlington, Oxford and the surrounding areas because of their exceptional service and high reputation for professionalism. There are several recreational activities in Kidlington all year round. The Kidlington circular walk is a 4 mile trek with the starting point at St. Mary’s Church through a well defined route on to Annie’s Tea Room. It affords a visitor the opportunity to have spectacular views of the ruins of the manor house and the flood plains. The walk is best undertaken between May and October when the route is relatively dry. The activity is a bird watcher’s delight as several species of birds can be spotted on this route. The Kidlington Leisure Centre is located off the main road to Oxford. It has facilities for gym, squash, an all-weather pitch, sauna and steam room, a 25m swimming pool, a sports hall and a soft play area. Many clubs and societies also exist and sports such as rugby and karate are not left out. Hotel accommodation is readily available. The Highwayman Hotel is located close to the Oxford Canal but more centrally located ones such as the Red Lion, the Black Horse and the Black Bull are also available.